Thinking of where to go to for your holiday this year? 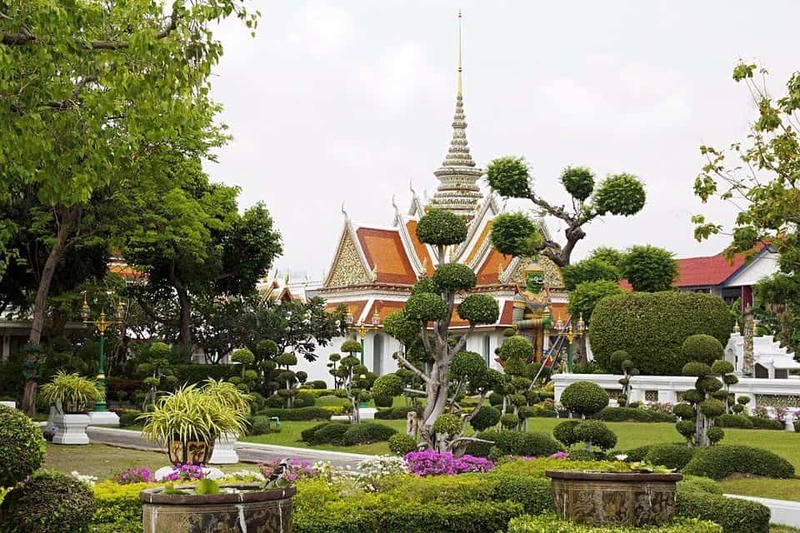 Thinking to plan a perfect Bangkok itinerary for multiple days? Read this post. The city is the capital and the most populous urban center of the Kingdom of Thailand. At present, the city is the most visited in the world, topping even London, Dubai, and Paris! To aid you in making the more informed decisions, we have seen it wise to examine what the city has to offer and the most suitable times to pay a visit there. Bangkok has numerous skyscrapers, broad streets, parks, museums, beautiful temples, and two major rivers i.e. Chao Phraya and Khlong Saen Saep. All these resources jointly confer to you opportunities for exploration, sightseeing, and admiration. 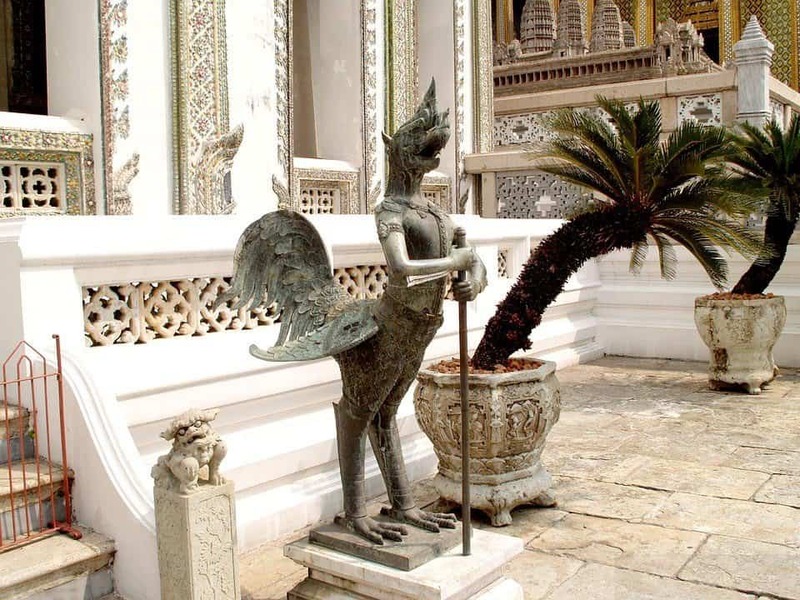 This Grand Palace is an opulent former royal residence which has since been converted into a museum in 1925. It is a must for your Bangkok itinerary. It is in the form of a building complex in Bangkok, Thailand. The structure was originally built the year 1782. It features some ornate appearance and is largely open to visitors. Visit and take pictures at this palace in your free time. Not a Buddhist? Worry not! You will still find it worthwhile to hang out at the temple of the Emerald Buddha (Wat Phra Kaew). This temple is basically a sacred shrine with the image of the reclining Buddha adorning its sacred grounds. 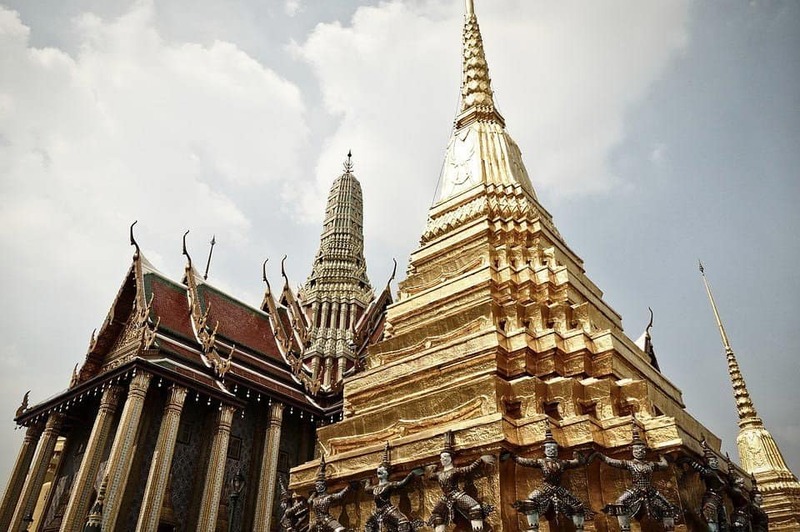 The building is generally hailed as the most sacred one in the entire nation of Thailand. Take some time and hang out at the facility. 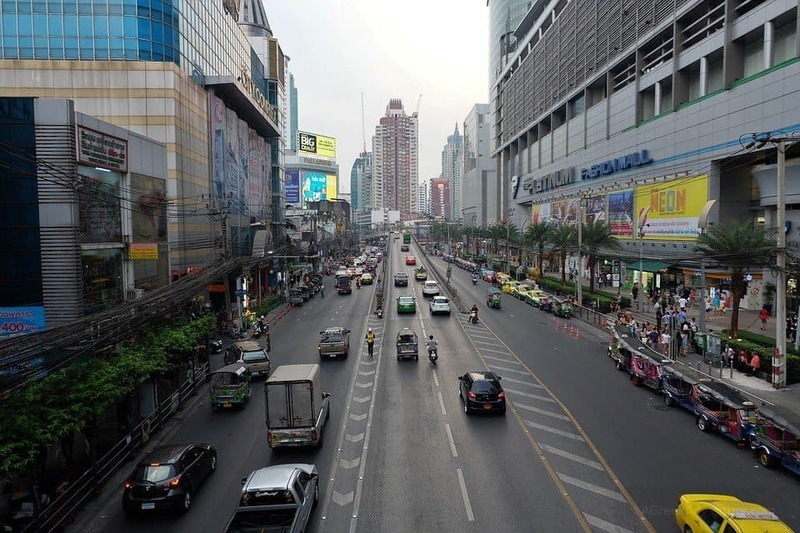 Located in downtown Bangkok, this is a short street which is lined with numerous shops and sales stands. On this street, you will be able to buy all kinds of merchandise and personal effects. Moreover, it also has several bars, lodgings, shops, and eateries. As part of your itinerary, you may consider hopping into any of them to enjoy the benefits they bring along. This street was called as “the centre of the backpacking universe” in the popular book “The Beach”. If you are a lover of photographs, you yet again have the Wat Arun Ratchawararam for your consideration. The riverside temple has a landmark spire which is breathtaking to behold. This is because the spire is ornately tiled and appeals greatly to the eyes. You may consider standing with this temple in your background and capture that awesome selfie. Perhaps no other public transport system in South Asia is as developed and great as the Bangkok Mass Transit System. The facility is clean, spacious, and pretty fast. Its elevated rail accords breathtaking views of the city and its metropolis. You have no choice but to squeeze time to take some rides at the facility at least once. Yaowarat is a segment of the city which is lined with Chinese markets and food vendors. If you fancy Chinese cuisines, do spare some time and sample these foods while at the place. You will also get to interact with other shoppers and relax too! You have no better way to relieve stress and stay in good shape other than finding your way here. With a 95% Buddhist population, it is no wonder that almost every other landmark in Bangkok has something to do with Buddhism or Buddha. This structure is an ornate temple with a gold Buddha statue. 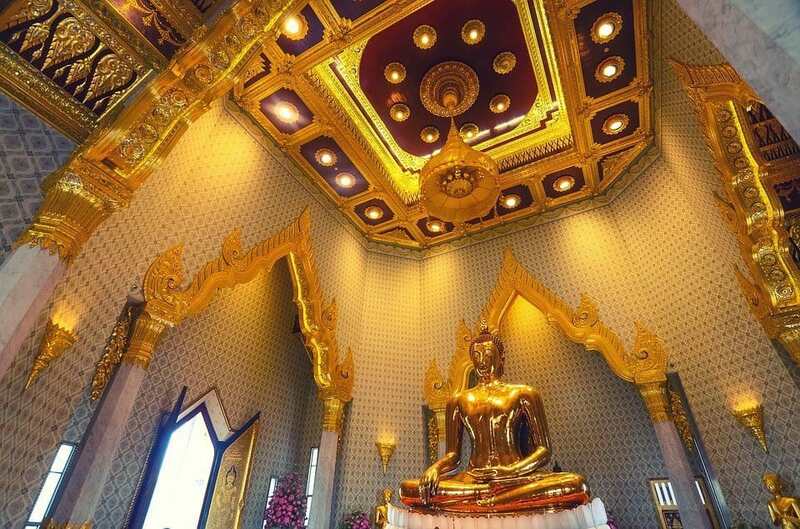 It also comprises a gilded exterior, several exhibitions and a massive golden statue of Buddha at its heart. This is a place to simply visit and gaze at. With numerous eateries dotting the city landscape and a great variety of cuisines to choose from, you can count on the city to satisfy your appetite considerably. Perhaps the most outstanding advantage the city has over other larger ones of its stature is the extremely low costs of living. You will subsequently buy foods at lower-than-normal costs. The city is graced with numerous parks, greens, and open spaces. 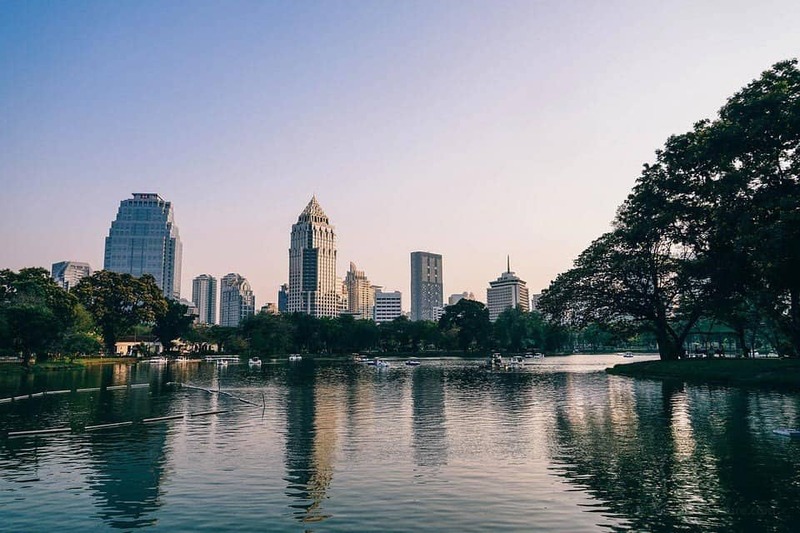 By far the top parks that the city has on offer are the Benjasiri Park, Benchakiti Park, and the Lumphini Park. These parks are spacious, less congested, and relaxing indeed. It is in your best interest to detach and spend some time at any of these parks. Throughout the city are numerous landmarks and skyscrapers. Examples of these are the King Power MahaNakhon, Sathorn Unique Tower, Elephant Tower, and the Baiyoke Tower II, to name but a few! These landmarks provide excellent photographing opportunities which you may wish to explore. Do take some time and capture them for future references. A visit to Bangkok is incomplete without a breakaway to any of the numerous opera houses and theaters which call the city home. In your stay at the visit, make it a point to pay a visit to Joe Louis Thai Puppet Theatre & the Art of Thai Cuisine, Bangkok NANTA Theater, Siam Niramit Theatre, Aksra Theatre, or the Calypso Cabaret theaters to catch any music or live performance show. Thailand has a rich past. This history is captured and showcased in the forms of artifacts, antiquities, relics, and other kinds of paraphernalia. You will find these items in the numerous museums and facilities that dot the entire landscape of the city. Some of these facilities are Jim Thompson House Museum, Bangkok National Museum, and Siriraj Medical Museum. As noted above, the majestic city is graced with two wide and navigable rivers. These are the Chao Phraya and Khlong Saen Saep. 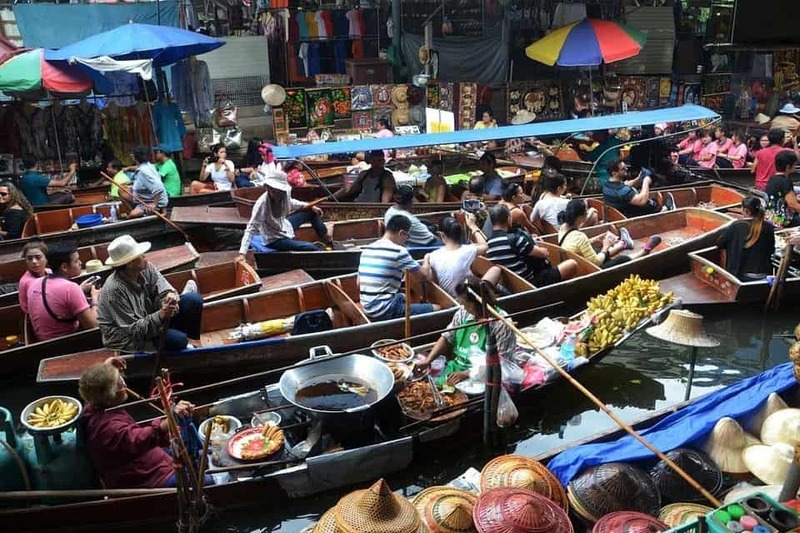 You can never boast of having visited Bangkok without a boat ride at any of these two rivers. You will also get to detach from the squeezed lifestyles and unwind at the same time. Being a port city, Bangkok is adorned with numerous beaches and seaside facilities. These beaches are further equipped with numerous resources which allow you to relax, swim, dive, and perform a host of water-based recreational tasks. This seaside resort is located only a few hours from downtown. It is a resort city which was initially constructed for the Thai Royal family. The area around the resort has some white beaches luxury hotels and accords breathtaking views of the adjacent blue ocean. If you can, do detach yourself and spend some of your time at the facility. No other beach facility is as great as this one. This is because it is detached from the mainland by virtue of being located on an island. In light of this, the beach facility is far removed from the squeezed, polluted, and congested nature of the Greater Bangkok area. It is a facility you must visit to unwind and reinvigorate yourself. Located around 140 km to the South East of Bangkok, this isolated, quiet and relaxed fishing village is indeed a great getaway. The village is lined with numerous resort hotels, shopping malls, high-rise condominiums, 24-hour nightclubs, and cabaret bars. You will find it a great destination if you are a shopping enthusiast. If you happen to travel to the city as a couple, you inevitably need some privacy. This is the beach to consider visiting. Other than being detached from the Bangkok mainstream, this beach is also secure, tranquil and possesses white sandy soils. 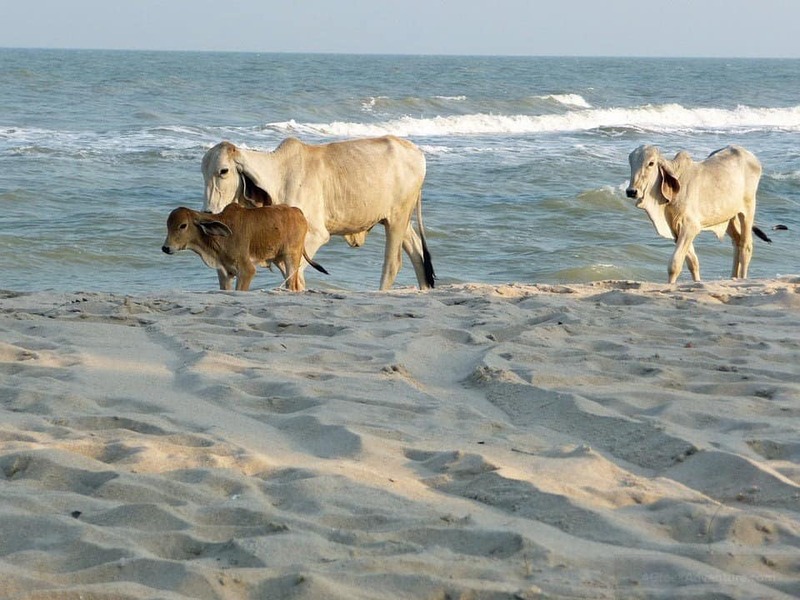 Do visit the beach to bond with your loved one. Straddling an entire length of the Gulf of Thailand is this Cha-Am beach. It is a sandy beach with shade trees and a variety of food. You will get to enjoy pony rides, banana boat tours and relaxing Thai massage by simply paying a visit here. Its proximity to downtown spares you of the need to spend too much time and money to enjoy the great resources it has to offer. If you are short on cash, this is the beach to consider visiting. It is the closest to downtown Bangkok. As such, it costs the least amount of money to visit. This is not to mention that you will also spend the least amount of time to commute to the facility. The beach is lined with numerous palm trees, swimming facilities and is also great for boating and sunbathing. Lastly comes the Kho Larn. This is a conglomeration of six beaches. At these beaches are white sands and clear azures water. Lining either ends of these beaches are also several restrooms and shower facilities. These beaches allow you to carry your own food and pay for the chairs separately. You have them for your consideration if you do not have that much cash. Just like every other major city of its stature, the city is endowed with innumerable shopping facilities. As the name suggests, this is a market that is best visited on a weekend. It is a sprawling marketplace which stocks a huge variety of merchandise mostly on weekends. The market comprises around 15,000 stalls which are further divided into 27 sections. It offers to any shopper an eclectic variety of goods, ranging from antiques to pets. Unlike most ordinary shops and marketing facilities, this one is an open-air mall that is lined with a river rather than a street. Through the river, it is possible for you to enjoy large and lighted rides with excellent scenic river views. At night, it is illuminated in such a way as to provide great scenic river views. This is by far Bangkok’s best-known shopping district. 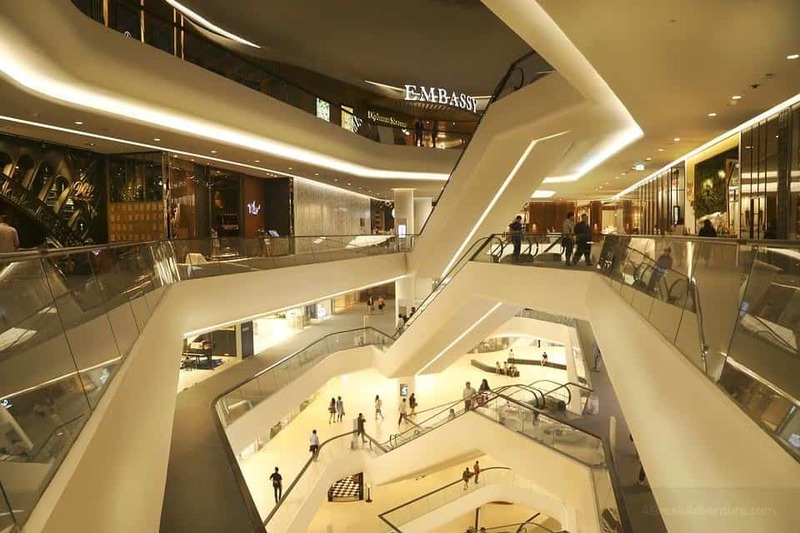 It is easily accessible via the Bangkok Transport System and lined on either side by many air-conditioned malls, luxurious curios, and plenty of opportunities to bag valuable items. You need some good financial resource endowment to be able to shop here though. Located along the Silom Road, this shopping district runs from the Chao Phraya River at one end to the tranquil Lumpini Park on the other end. It is served with the BTS Skytrain and MRT transportation options conveniently. You will find all kinds of merchandises you might want here and at the most affordable cost to you. Popularly called the ‘Mother of All Malls,’ the complex brings together all kinds of shopping centers and boutiques. You will find all sorts of jewelry, electronics, garments, and other household commodities here. Regardless of the financial resource base at your disposal, you might be certain to find a commodity that suits your budget space. Located at the intersection of Petchburi and Ratchaprop roads right next to Amari Watergate Hotel, this shopping district is filled with shops and tiny stalls. These stalls and shops stock clothes, fashion accessories, shoes, and other goods mostly at wholesale prices. You definitely want to pop up into the complex grab at least one of this merchandise. Still along the banks of the two major rivers that flow through the city of Bangkok are several shopping facilities. There is the famous floating market. You will need only 2.5 bhats to cross one bank of the river to another. You will be able to purchase clothes, bags, shoes, handbags, fashion accessories, food, and fresh fruits, among many others. 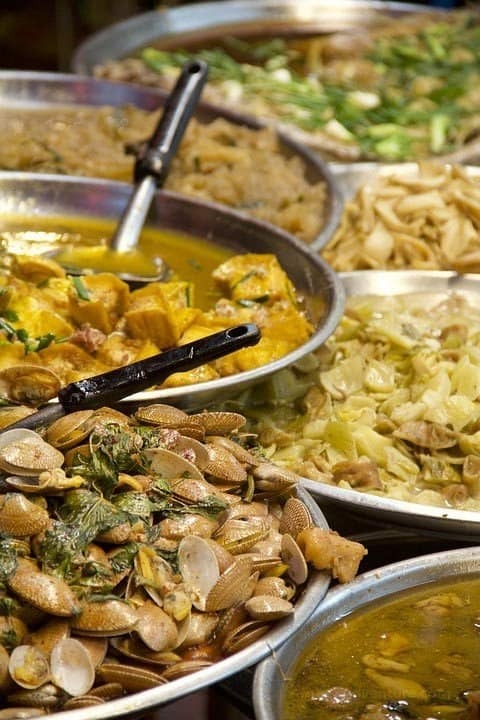 For a really “local style” experience make sure to try these Bangkok food tours. 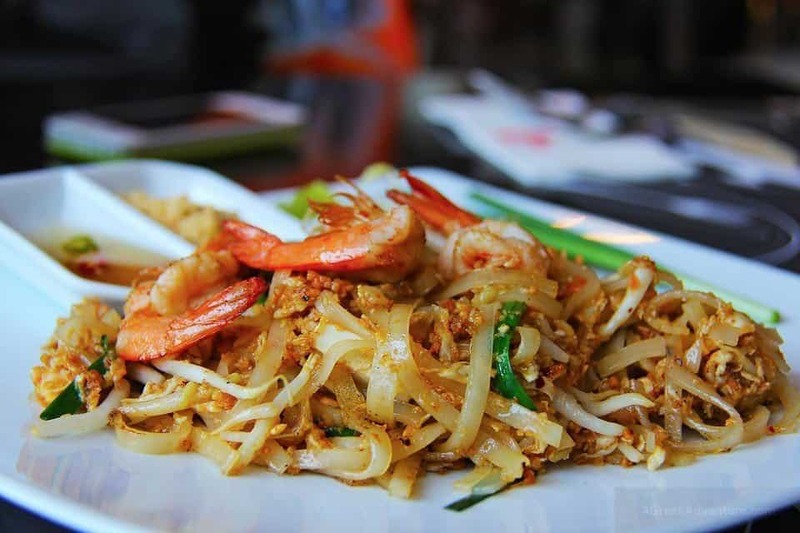 To further make your visit to Bangkok more memorable, you want to have a taste of its cuisine. 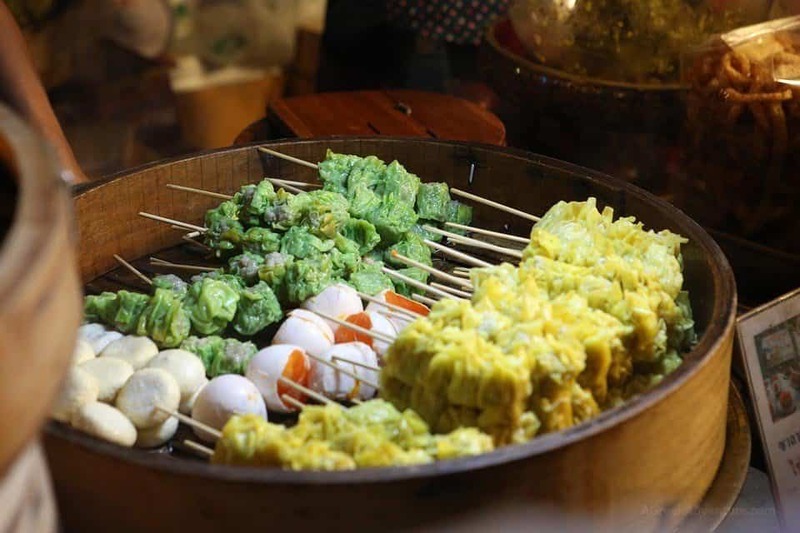 It is for this reason that you want to sample a couple of the street foods that are endemic to Thailand. This is basically stewed pork that is mixed with rice and boiled eggs. Being a common cuisine, you will find it in almost all the restaurants and eateries that are found in Bangkok. The actual cost varies mainly with the exact place you decide to purchase it from. As the name suggests, this is rice that is served alongside chicken. 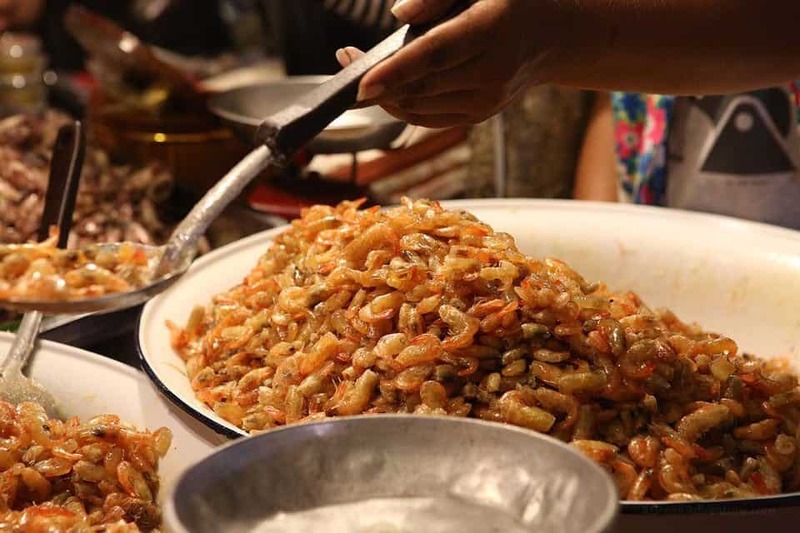 It is also a popular cuisine which you will find everywhere you travel to. The dish has variations which may include spices and food color. Be sure to specify these differences as you place your order to be on the safe side. Kuay Jab Nam Sai is a peppery noodle soup which is served on a bowl and eaten using noodles. The soup is great for those persons who are intent on burning fat. The chilly heat dilutes the fat by converting it into liquid and allowing it to be absorbed in the body easily. If you are a lover of anything seafood, you might want to try this one. On the whole, it is a spicy soup which features numerous sea fish varieties. It is a great source of protein also. You might wish to try it out if you are intent on building your body. Joke Moo is a special kind of porridge. Rather than being made from grains, it is made from Rice. The rice is complemented with pork and stirred into a thick yet viscous liquid. You may choose to use the noodles or simply drink the porridge the normal way. Yet again if you are a lover of seafood, you may have to consider this Poo Aob Woonsen. Its roots are in Singapore rather than Thailand. In its simplest form, it is a rice vermicelli dish in which a whole mud crab is served and topped with some milky broth. Lastly, you might again wish to taste the boat noodles otherwise called Kway Teow Rua locally. This is basically an assortment of several protein dishes which are served with noodles. You will have to make use of a stick or noodle to help yourself with them. Shangri-La is a premium riverfront property. It serves 9 dining options for you to select. Moreover, it also has an outdoor pool, tennis courts, and a luxe spa. The location wherein the facility is based is an upscale area. It is very secure and tranquil enough to guarantee you maximum comfort and serenity. This is a polished, contemporary lodging. It does boast of a vibrant international restaurant, a spa, and an outdoor pool as well. Located in Ratchathewi District, this facility is served by a busy public transport hub and surrounded by the lofty Victory Monument which is great for sightseeing. The Grand Fourwings Convention Hotel is a high-end 5-star hotel. It incorporates 3 restaurants, 3 bars, and an outdoor pool. What’s more? The facility can make arrangement for a complimentary airport shuttle. Its location in the bustling thoroughfare in the Bangkok industrial area means it is easily accessible to you. Unlike every other hotel under consideration, Al Meroz Hotel Bangkok is a 4-star rather than a 5-star hotel. For this reason, it is cheaper to afford than most alternatives. With warmly decorated rooms, an Arabian-inspired hotel, you may count on the hotel to offer you a rooftop pool and halal dining. If you fancy style and elegance, you have this 5-star hotel for your consideration. Its chic rooms and suites coupled with its location in an upscale property offer multiple eateries and bars. The outdoor pool tops up the list of its most elegant features for you. Located in an upscale area, this 5-star hotel has stylish rooftop bars, two outdoor pools, nine refined restaurants, and various antique stores. These combine to make your stay at the facility quite fruitful and rewarding indeed. While at the facility, grab some posh Italian cuisine that is abundantly available. As a last major option, you might also want to attempt this Park Hyatt Bangkok 5-star hotel. It is basically an Haute quarter which is situated in a posh hotel. The facility features a 2-floor spa, tri-level dining, and entertainment complex. Its proximity to swanky malls will make your shopping a bliss. Knowing when to visit Bangkok is just as important as leveraging the awesome resources it has to offer. This is because the temperature and weather patterns fluctuate significantly. This fluctuation determines to a great extent the levels of satisfaction you might accrue at any given visit. For a start, Bangkok has a tropical monsoon climate. It generally remains hot and humid year round. This notwithstanding, the peak tourism season is the November to March timeframe. Conversely, most tourists shun the city between the months of March, April and May as they are the hottest. This starts in December and ends in February. The average temperature is 20°C. It is a perfect time to travel out and about Bangkok on foot. Starts in March and ends in May. Experiences average temperatures of around 30°C. The Thai New Year is celebrated at this time. Due to the extreme glare of the sun, you are advised to carry your sunglasses. That season commences in May and goes through to October. It experiences an average temperature of around 30°C. This is the best time to visit Bangkok for shopping, visiting the aquarium, and other indoor activities. Now that you know all you might want to make a sound decision, why not go ahead and plan a visit? It is never late. 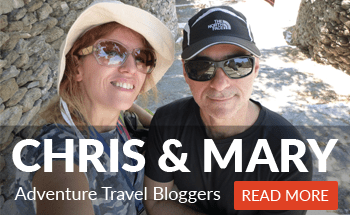 Just consult your travel agent to get started. We look forward to guiding you in and out the wonderful city of Bangkok soonest possible. Please share this information as far wide as possible!